Klosterneuburg [ˈkloːstɐnɔɪ̯bɛʁk] is a town in Wien-Umgebung District, in the Austrian state of Lower Austria. It is the state's third largest town with a population of about 26,000. The Klosterneuburg Monastery, which was established in 1114 and soon after given to the Augustinians, is of particular historical importance. It is located on the Danube River, immediately north of the Austrian capital Vienna, from which it is separated by the Kahlenberg and Leopoldsberg hills of the Vienna Woods range. It has been separated from its twin city of Korneuburg on the left bank of the Danube since the river changed its course during the Late Middle Ages. Both towns are connected by a reaction ferry link. The municipal area comprises the northern tip of the Donauinsel as well as the 515 m (1,690 ft) high Mt. Exelberg with its telecommunication tower. As the site of a pioneer school of the Austrian Bundesheer, Klosterneuburg has various military buildings and stores. It is also the centre of a wine growing area, with several esteemed vintners, numerous Heuriger taverns, and the Federal Institute for Viticulture and Pomology, where the Zweigelt and Blauburger red wine grapes were bred by Fritz Zweigelt. Due to its hilly location, Klosterneuburg has several geographical areas within the cadastral communities of Klosterneuburg-Stadt, Gugging, Höfling an der Donau, Kierling, Kritizing, Weidling, and Weidlingbach. Its town centre has two main shopping areas, the Niedermarkt and the Rathausplatz, separated by a steep hill. The town is tightly linked to the Austrian caital and houses some of the most affluent citizens of Lower Austria. It has direct access to the Vienna city centre via the Klosterneuburger Straße highway (B14), by the Vienna S-Bahn network on the Emperor Franz Joseph Railway line (S40) from Franz-Josefs-Bahnhof to Tulln, and along the EV6 The Rivers cycling route. The town is the site of light industry and, whilst not belonging to Vienna, has almost the feel of a suburb. The well-known Essl Museum of contemporary art and the Institute of Science and Technology Austria established in 2006 are located in the town. Archaeological findings denote a settlement of the area already during the Neolithic period. In the Roman era (1st to 5th centuries), a fort of the Danubian limes stood at the site of Klosterneuburg on the northwestern border of the Pannonia. After Charlemagne had defeated the Avars, a Carolingian settlement in the newly established Avar March recorded as Omundesdorf may correspond to the site of the town. Klosterneuburg itself was first mentioned as Nivvenburc (Neuburg, "New Castle") in a 1108 deed. In 1113 it became the residence of the Babenberg margrave Leopold III, the later patron saint of Austria. In 1114 Leopold, son-in-law of the Salian emperor Henry IV by his marriage with Agnes of Wailingen, had a princely castle erected together with a collegiate church on a hill rising directly from the banks of the Danube, which he transferred to Augustinian canons in 1133. This order is one of the oldest and richest of its kind in Austria; it owned much of the land upon which today the north-western suburbs of Vienna stand. Later, Duke Leopold VI of Austria (d. 1230) also had his residence there during parts of his reign. It was also here where Leopold VI's eldest son climbed a tree, fell and died. The monastery complex include the old chapel of 1318, with Leopold's tomb and the Verdun Altar, dating from the 12th century, the treasury and relic-chamber, the library with 30,000 volumes and numerous manuscripts, the picture gallery, the collection of coins, the theological hall, and the winecellar, containing an immense tun like that at Heidelberg. The market on the left river bank quickly developed in conjunction with the famous monastery on the right bank. While the Danube was an important waterway trade route, it also repeatedly affected the citizens by floods. In the late 13th century, the two parts of the town, Klosterneuburg (the monastery) and Korneuburg (the market), had grown apart, whereafter the Habsburg king Albert I of Germany granted separate town privileges to Klosterneuburg in 1298. The town was devastated by Ottoman forces both in the 1529 Siege of Vienna and the 1683 Battle of Vienna. In the 18th century Emperor Charles VI, who could not prevail in the War of the Spanish Succession, set up plans to rebuilt the Klosterneuburg monastery complex modelled on the Escorial. The construction of the Baroque buildings began in 1730, it did however did not survive an initial phase. After the Austrian defeat in the 1805 Battle of Austerlitz, the town was occupied by Napoleonic troops until 1809. A winemaker's town during the 19th century, Klosterneuburg developed to a recreational and residential area of Austrian officials working in the nearby capital. 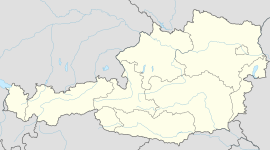 During the Anschluss of Austria to Nazi Germany from 1938, Klosterneuburg was incorporated as the 26th district of "Greater Vienna", which was reversed with the establishment of Wien-Umgebung District in 1954. Klosterneuburg was recently selected as a main motif for a high value collectors' coin: the Klosterneuburg commemorative coin. The obverse shows a view of the abbey from the slopes of the Leopoldsberg in the Alps. The Romanesque-Gothic basilica as well as the copper dome with the imperial crown can be seen. This article incorporates text from a publication now in the public domain: Chisholm, Hugh, ed (1911). "Klosterneuburg". Encyclopædia Britannica (11th ed.). Cambridge University Press. "Klosterneuburg". New International Encyclopedia. 1905. This page uses content from the English language Wikipedia. The original content was at Klosterneuburg. The list of authors can be seen in the page history. As with this Familypedia wiki, the content of Wikipedia is available under the Creative Commons License.